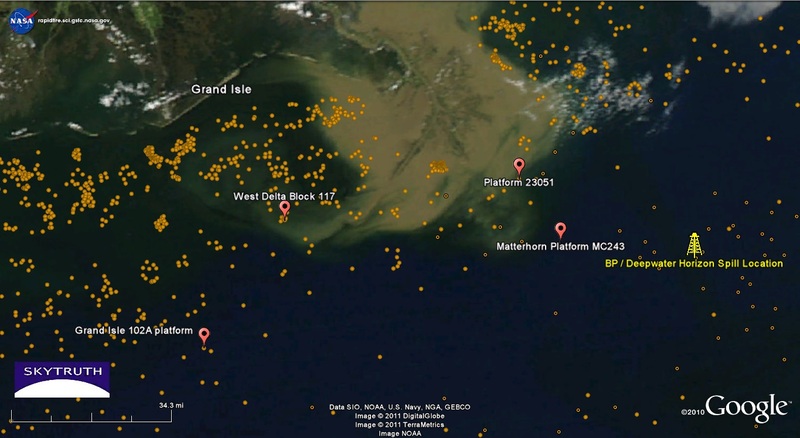 Latest Gulf Oil Spill – Mystery Solved? It looks like our guess yesterday may have been correct: the oil spill that came ashore in Louisiana this weekend originated about 30 miles offshore in West Delta Block 117, at the site of a platform destroyed by Hurricane Katrina in 2005 that was operated by Anglo-Suisse Offshore Partners, LLC, according to a Louisiana official. The Coast Guard and BOEMRE have not officially acknowledged this yet. Click here for a map showing the location. On March 18, Anglo-Suisse reported to the National Response Center a spill at 4pm local time at the site of Platform E during plugging and abandonment operations. They claimed a total amount of spilled oil of – get this – half a gallon, making a slick 1320 feet long and 20 feet wide. Yet this same tiny spill somehow managed to come ashore 20 miles away, impacting beaches at Elmer Isle, Grand Isle and Fourchon; creating a slick that, as seen from the air, appears to stretch for miles. You may be wondering a few things, like: who the heck is Anglo-Suisse, and what are they doing drilling in the Gulf of Mexico? Well, it turns out that a lot of relatively obscure companies operate wells in US waters, many without the deep pockets of Shell and BP, and with no retail brand to protect if things go wrong. You might be asking, this spill was caused by a well damaged during Hurricane Katrina, more than five years ago? In fact, wells damaged by Hurricane Ivan more than six years ago are still leaking, and this industry report shows there’s still a significant backlog of work to safely decommission all the storm-damaged wells and platforms in the Gulf. You may question how good our national oil pollution reporting system can be when we rely on the polluters to turn themselves in and accurately report what they’ve spilled — knowing full well they are subject to being fined based on that amount, and knowing it’s highly unlikely the state or federal government will send anyone out to check on the incident (especially if it’s small). Once again: we need independent, transparent monitoring of pollution in the Gulf. /wp-content/uploads/2016/08/test_logo.png 0 0 John Amos /wp-content/uploads/2016/08/test_logo.png John Amos2011-03-23 13:12:002019-02-26 10:27:46Latest Gulf Oil Spill - Mystery Solved? Oil Spill in Gulf of Mexico Last Weekend – Questions Remain Gulf Spill – Not So Fast – Problem at LOOP?